I’ve recently reviewed Mygica ATV1900AC TV box powered by Amlogic S812 with 2GB RAM and 16GB eMMC running Android Lollipop, a device with some high quality components, and a RF remote with voice command and search function that sells for $180. Tinydeal, a Hong Kong-based online shopping site specialized in electronic goods, sent me Tronfy MX4 Telos with very similar specifications including support for 802.11ac and Gigabit Ethernet, but selling instead for nearly half price at $98.99 including shipping. The firmware is also based on Lollipop, and runs Android 5.1.1 instead of Android 5.0.2, and it will be interesting to find out how the cheaper product fare against the higher-end one. Compared the Mygica model, it adds a 3.5mm jack for composite and stereo audio and Bluetooth 4.0, but instead of 4 USB ports it gets only 2 USB ports and a micro USB OTG port. It also does not come with a fancy RF remote, but a simpler IR remote. The company sent me the device via DHL. The retail package shows some of the main features of the device (Gigabit Ethernet, 4K UHD, H.265, etc..), and seems to have been optimized for low transportation cost, as it is quite thin and compact compared to other products I’ve received. The full model number of the box reads “TVB-MXIV Telos”. 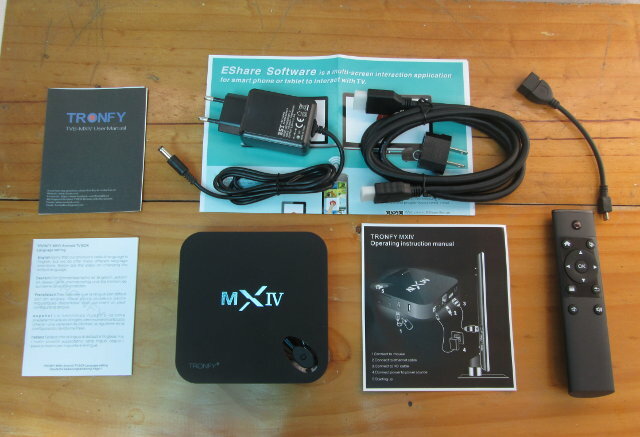 The box comes with an HDMI cable, an OTG adapter, an IR remote control, a 5V/2A power adapter (EU), and a user’s manual, an “operating instruction manual”, another user’s manual in English, German, French, Spanish and Italian, as well as some documentation about Eshare software that is used to share all sort of files with your mobile devices (iOS only? ), and includes support for DLNA and Airplay. The case looks very familiar, as I’ve also seen it been used on some other devices such as Probox2 EX. The power button is conveniently located at the front top of the device, the micro SD slot, micro USB OTG port, and two USB 2.0 host port are located on the side of the device, while the DC jack, AV jack, Ethernet port, HDMI output, and optical S/PDIF port can be found on the rear panel. If you are interested, you can also watch the unboxing video. 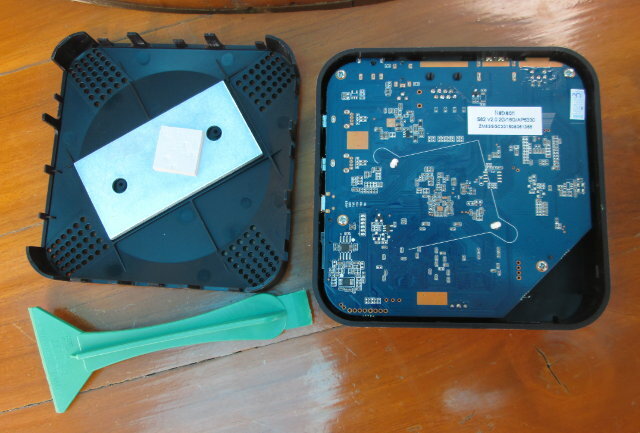 There aren’t any screws to remove to open the device, and you’ll see to use a sharp object to pop-up the cover, such as the green tool shown below, and part of most disassembly kits. The sticker on the board shows this is one of the many boxes made by Netxeon, and the product name is S82. 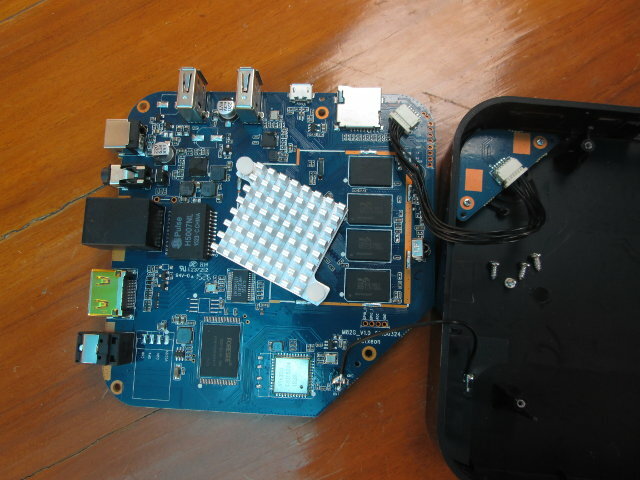 I had to loosen four screws to complete take out the board, which is also connected to the Power button board. Finally, I’ve removed the heatsink to get a better look at the board. 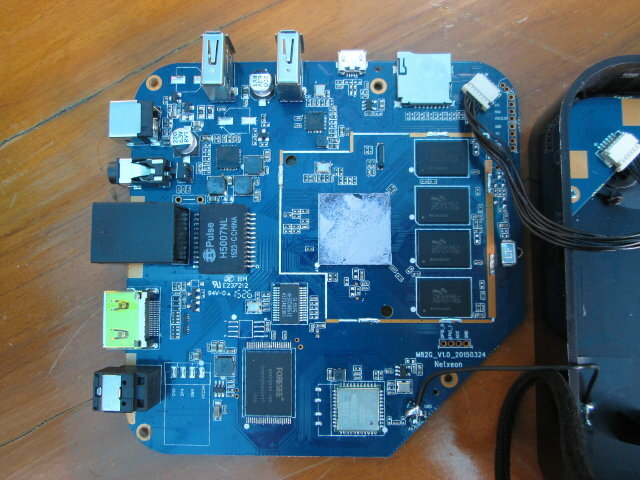 The board name is M82G_V1.0_20150324 by Netxeon, and looks like a revision of the board used in Probox2 EX with some minor modifications, and different components. A 16GB Foresee NCEFBS98-16G eMMC 4.51 flash is used for storage, while four Mezza Z3P4GF4BLF A521LK-GGN chips are used to get 2GB RAM. Mezza must be a new and cheaper player on the RAM market, as I can’t find any information about this company. The wireless module is the popular AP6335 bringing Bluetooth 4.0 and dual band WiFi connectivity to the device, including 802.11ac. Pulse H5007NL is a 1000base-T magnetics module for Gigabit support, but on Amlogic SoCs, Gigabit Ethernet usually means 200 to 300 Mbps. I’d like to thanks Tinydeal for providing the device for review, and if you could consider purchasing Tronsfy MX4 Telos for $98.99 on their store (Update: use tronfy4 coupon for a better deal). The box also used to be on Amazon US, but Tronfy does not list it there anymore. Tronsfy MX4 Telos appears to be based on Beelink MXIII Plus, that can be found on Gearbest, Geekbuying, eBay, Aliexpress, and others, but the devil may be in the details as the specs are not the same across the board. Some devices will run Android 5.1, while most are still sold with Android 4.4, and 802.11ac or Gigabit Ethernet may not be supported, while some devices come with 8GB flash instead of 16GB… So make sure you double-check the specs before you buy, and when you receive an MX3 Plus box. Tronsfy also has its own website, where you can find MX4 Telos. I ordered this exact box but using tronfy4 code it was out the door for $91.85. Hell of a deal for the paper specs so we shall see how it performs once it arrives. Should be in the next few days. Talked today with AMLOGIC and they said will not maintain their support for Android 5.1. Then, just Android 4.4 will be supported from now. I did not explain well, not support for Android 5.1 over S812 platform. Actual problem with A80 comes because only one design house is selling a TV Box board, it is not massiveand expensive. 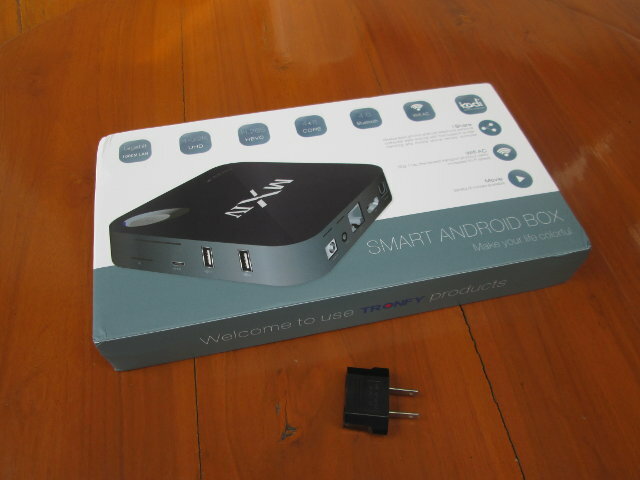 Could you tell us your top 5 android tv boxes? These were just awards for a given features, but maybe still interesting. Some boxes were I had a rather positive conclusion at the end of the review include MXQ S85, Probox2 EX, Zidoo X9. That said firmware gets updated, and I don’t review the latest firmware nor all boxes on the market, so I’d look into boxes from companies such as Rikomagic, Ugoos, Tronsmart, MINIX… The three I mentioned also get firmware updates. The right box for you will depend on your usage, and will not be the same for everybody.